The Exselle Gold Plated Textured English Stirrup Earrings are shaped like English Irons and are accented with a texture. 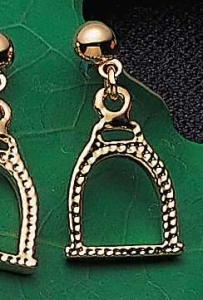 The earrings have a 22k gold plate and like all Exselle products it comes in a blue velvet box. Comes with Titanium Hypo Allergenic Posts & Stays.